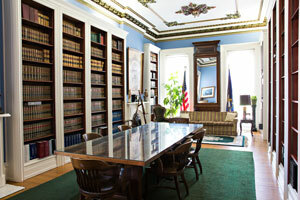 The large Italianate limestone-faced home built by Jacob D. Shutt at 28 West Fifth Street in Covington is now the Law Offices of Attorney Garry Edmondson and his associates, son Alex Edmondson, Jason Reed and Sharon Yelton. This once mansion-home of J.D. Shutt first appears in local address books at the Covington Library in 1869. J. D. Shutt was born in 1827 in Conewango, Warren County, Pennsylvania. He moved from Pennsylvania to Cincinnati in 1850 at the age of twenty-two. On September 6, 1855, Shutt married Sarah A. Richardson in Cincinnati, Ohio. Sarah's father was a wealthy lumberyard owner who Shutt began working for as a clerk. According to Jim Reis's Pieces of the Past, Shutt, who worked as a clerk in the Richardson Lumber Company soon led to success the old fashion way, he married the boss' daughter. The Shutt and Richardson lumber company was located on Scott Street between 2nd and 3rd Street. Shutt was elected to the Covington City Council in 1863 and elected its President in 1865. In September of that year, Shutt attended a reception for General Ulysses Grant in Covington. On December 28, 1865, Shutt was elected to a seat in the State House of Representatives. Shutt, who was described as a Radical Republican, defeated Harvey T. Wilson, a Democrat by a vote of 816-801. In August of 1881, Shutt was the Republican candidate for the State Senate. Shutt's opponent was Democratic State Representative Ted Hallam, (Hallam Ave. in Erlanger) a very well known attorney and orator. Hallam defeated Shutt by a vote of 1781 to 1713. The next year, Shutt was elected to the First National Bank Board of Covington. Shutt died in the mansion February 19, 1895. His wife Sarah survived him. Their two minor children died as infants. You can see representations of them carved into the limestone at the entrance to the home. At the time of his death, it was noted that he occupied many positions of trust; President of the City National Bank, the Cincinnati Camp Meeting Association, Highland Cemetery Company, Director of the Protestants' Orphan Home, Vice President of First National Bank of Covington, a member of the Union M.E. Church and of Washington Lodge of the Independent Order of Odd Fellows. According to Jim Reis's Pieces of the Past, Shutt is buried in a private mausoleum at Highland Cemetery in Fort Mitchell with erected on top is a life-size bronze statute of himself. He had commissioned the mausoleum at a reported cost of $40,000. Sarah continued to live alone in the mansion until her death, in the home on February 4, 1918. However, Sara and the two children are not buried there, but rather in unmarked graves at Spring Grove Cemetery in Cincinnati. Reportedly, Sarah was so upset with her husband for having spent so much money on the mausoleum she refused to be buried there. The home passed to other notables after Sarah's death. In 1918 Harry J. Meyers, an attorney who served for twenty-two years in the State House of Representatives from 1910 to 1934. William Frick, a real estate broker with Ft. Mitchell Realty, purchased the home and operated it as an apartment building and rooming house through WWII. He removed and sold some of the custom-made wrought iron fencing around the property for the war effort. Sometime during the 50's a man hung himself in one of the rooms (now an office). Together with the deaths of the Shuts in the home, this could very well account for the claims of some of the occupiers over the years that they have heard foot steps on the staircase and sensed something spooky at night. The cast iron rosettes on the front of the fence, matches the wood carved rosettes on the front door. Thankfully, the fourteen foot high ballroom ceiling (law library) with its ornate plaster carvings were left intact during the disastrous, modernizing wave of the 50's and 60's. Many of the soapstone and metal fireplaces as well as all of the nine and ten foot doors remain. Over the years the lawyer's children have enjoyed the three-story curved wooden handrail over the protests of their fathers and mothers. After suffering the typical perils of older property in the 50's and 60's, it was purchased in 1973 by attorneys Paul Vesper and Ed Winterberg. Winterberg ran for Congress twice during the 70s, without success. Vesper and Winterberg cleaned out the upper floors, repaired windows and open law practices in the old home. It was not until 1975, when attorney Garry Edmondson purchased a share of the ownership from the original urban pioneers, that real progress began in the restoration of the old mansion. After a few months of work, Vesper and Edmondson purchased Winterberg's share. This began several years when their evenings, weekends and holidays were filled with their sweat equity. On many occasions their unfortunate friends and relatives were recruited in the effort to restore the mansion. Substantial success was achieved about 1980. Eventually Edmondson became the sole owner of the property in the early 1980's and continues to restore and improve the grand old mansion. Today, seven lawyers practice out of the building. Recently a set of brick garages were built in the rear, reminiscent of carriage houses of the period of the original home. There continues the tradition of the mansion's nurturing of politicians. Besides County Attorney Edmondson there is also in residence former Covington Commissioner Alex Edmondson, State Representative Arnold Simpson and in the past former Judge Joseph Condit practiced there. What's in store for J.D. 's mansion over the next 135 years, based upon its past, will be something to watch. Jun 25 Where There's a Will, There's a ... Tablet? Jun 17 Do Jurors do the Darndest Thing ...?